Ferriss and Covey. They are both bald. Stephen Covey died July 16th. I read it first on Facebook. A friend posted the news on my wall. I felt a pang of sadness and Googled the news. A brief article on CNN reported that he'd died, at 79, due to complications following a dreadful bike accident a few months ago. Must have been a difficult few months for him and his family. He died, the report said, surrounded by his wife, children, and grandchildren, as he'd always wanted. Of course he did, I thought. Of course he managed to die the way he wanted to. He was Stephen Covey, author of The 7 Habits of Highly Effective People. His Habit #2 is Start With the End in Mind. Literally, as I explained in this post. His last moments had to be successful. And they were. This made me feel good. I wondered what I could say about him besides, "Thank you for increasing my blog's page hits every time I mention you. I've enjoyed poking fun at you, but I've also admired your willingness to put principles and values at the center of what you do." But what else could I say? Then a friend of mine sent me Frank Bruni's article from yesterday's NYTimes. Frank Bruni, I recall, used to be a food critic. Now he's an op-ed pundit, which means that now, instead of food, he critiques whatever he wants. Fine. Bruni responds to an article in the Sunday Travel section about Tim Ferriss and the fancy clothes he takes when he travels, and the way he gets around rules to make life sweeter for him. 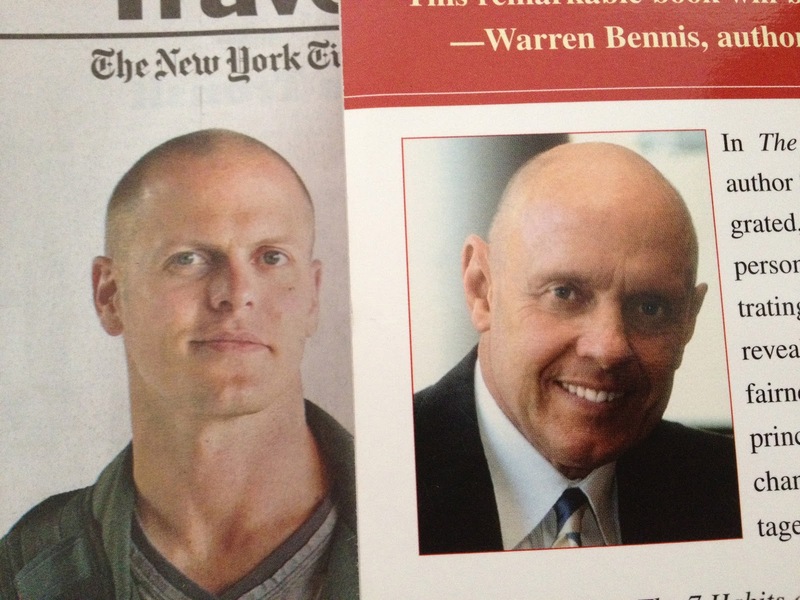 Tim Ferriss, for those who live under a rock, is a lifestyle guru. His books, the 4-Hour Body and the 4-Hour Work Week, the latter with a subtitle about getting rich, have sold millions. I am proud to say I've read none of them. However, I have read whatever the New Yorker has written about him, and I did see that Travel spread. As did Frank Bruni. And it pissed him off. Bruni pinpointed for outrage two travel tactics Ferriss adopts. The first: putting a starter pistol in his luggage, if he's going to have to check it, because any kind of gun in a suitcase will attract attention to it--and the airline will never lose it. (Don't do this on international travel or they'll try to lock you up with your suitcase--book possibility: the 4-Hour Interrogation). The second: instead of paying for airport parking, just let your car rack up parking tickets on the street. You'll pay less for the tickets than for the garage. Okay, I'll admit it. I liked the jacket Ferriss was wearing, and until I realized who the article was about, I thought maybe I could afford one like it. I'll also admit that I thought the starter pistol in the suitcase was an audacious, but kind of funny, idea. Frank Bruni, however, set me straight, fulminating that sure, go ahead and cause concern and mayhem behind the scenes at the airport, as long as it benefits you. He says, "Don’t pay for airport parking, he [Ferriss] advised in The Times, if the accrued tickets from leaving your car on the street won’t be as expensive. Sure, you’re unlawfully hogging a space someone else might make legal use of; maybe you’re thwarting street sweepers, too. Not your problem. A conscience is for chumps." Readers, I was chastened. I was sorry I'd been amused. And I agree with Frank Bruni that Ferriss, guru of the year, has made millions off of the principle of getting the most for yourself, damn the consequences to others. Can you imagine what Stephen Covey would say about him? Upon what are Ferriss's principles centered? Luckily for us, there's an appendix at the back of The 7 Habits of Highly Effective People to help us. Covey lists about a dozen possible centers for your life--Friends, Spouse, Money, Family, Work--and the way these various centers can skew your values and therefore your behavior and your life.... A quick scan leads me to Self. If your self is your center, then your principles are centered on the need to justify anything that serves your best interest, and are "adapted to need." In other words, they are amorphous, flexible, and are therefore not really principles at all. Covey's appendix continues with Church and Principles as other possible life centers. All of these possible principle-centers, according to Covey, lead us astray, except one. Principles. So even though he's a member of a church, Church is not the Covey-approved center for life. It's principles. Which is why, really, we can admire Covey, or hate him, but we can't say he's trying to shove his particular church, the Mormon one, into the center of our lives. He's aiming for something universal. This is the polar opposite of what Bruni describes as Ferriss's "epic narcissism." As for Ferriss, I've already admitted I haven't read his books. I am responding to Frank Bruni's response to an article about him. Maybe Bruni is wrong about Tim. I doubt it, though. 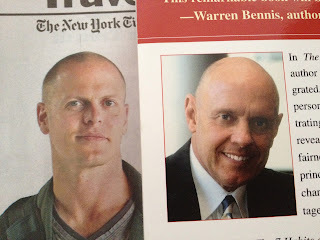 I am curious to see if, eventually, Tim Ferriss re-evaluates his life, and finds a principled Principle-center for it. In the meantime, I guess we've got Frank Bruni to help us. And he's not even bald yet. I wonder if he's read Stephen Covey? At least we've still got his book.